Florsheim Homes is proud to be back in Turlock with gorgeous NEW home designs! 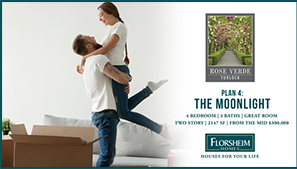 Rose Verde will encompass 107 total homesites and five unique floorplans. Both single level and two story designs will showcase the latest in California interior design style, and outstanding architectural character. These 3 to 5 bedroom plans range from 1545 to 2428 square feet and feature solar electric as a standard feature. Optional California Rooms and Sun Porches help to extend the indoor space to the outdoor areas. Contact the Sales Team at (800) 985-HOME (4663) or jwatson@florsheimhomes.com for more details. Model homes are now open 7 days a week! ...and discover the quality and care in every new home. Contact the Sales Team at (800) 985-HOME (4663) or jwatson@florsheimhomes.com for more details. Model homes will be open later this year.